I had a great run today, but it wasn't the one I had planned. I headed out early to Bethpage to run the bike trail and to take on some hills. 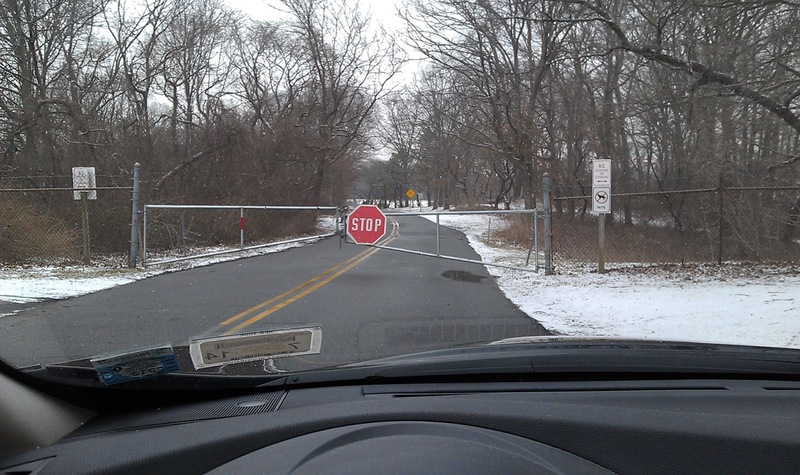 When I arrived, I saw that the drive leading into the park was locked and gated. I thought at first to drive to Haypath Road and park where the Greenbelt trail continues north. Along the way I noticed that the bike path had a lot of snow, so I headed back home. My neighborhood roads had some icy patches this morning. I'd initially dismissed the idea of running in my neighborhood, but when I returned from Bethpage I saw that the streets looked much clearer. I figured that since I was already dressed for an outdoor run, I'd be better off outside than on the treadmill. After minutes of standing out in the cold, my Garmin acquired its signal and I was finally off. Today's plan was to run hard, and that's what I did. There was still residual snow on the far right and left sides of the streets, but I felt that I had enough room to maneuver to maintain safety. Traffic was sparse, so I was able to focus on the effort at hand. For the longest time, I've been running at what I call "equilibrium" pace. That's the speed I go when I just tune out and run, usually between 9:30-9:55 per mile. The speed and effort curves crossed to the left of normal today and I came through the first mile in the 8:30. I didn't record a single split above 9:00. Following my 8:30, my timing went 8:59, 8:58 and 8:26 (for the partial). My overall pace was 8:45/mile, making it my fastest training run in ten months. My heart rate stayed exactly where I wanted it, topping out about 5 BPM below max. The shorter distance prevented today's harder effort from causing me undue fatigue. In fact I've felt more energized than usual since the run. The challenge will be to maintain that level of focus going forward, at least until race day. Not every run needs to be speedy, but that will be my bias between now and the 23rd. With what do you attribute your faster pace? Is it all that treadmill running? I'm sure that pushing the pace on the treadmill helped a lot. But I think it was focusing on speed, rather than distance, that got me there today. After a few dozen races, I've come to understand how much my mindset drives my performance.